I know some of you are getting your feet wet (or rediscovering) vinyl records and playback. Protect your records. Doesn't matter if you got your dad's record collection or found a bunch at a used store or took a chance with some new Audiophile vinyl releases. You need to protect your records. This is more important than how they sound right now. How your system treats them is key. Don't wear out your fragile grooves by a mistracking needle. When you upgrade in five months or five years, don't be taken off guard by how your current system has trashed your grooves. BE AWARE NOW!! Back when I was a kid my Dad got me one of those Zenith dark green fold-out portable phonographs. 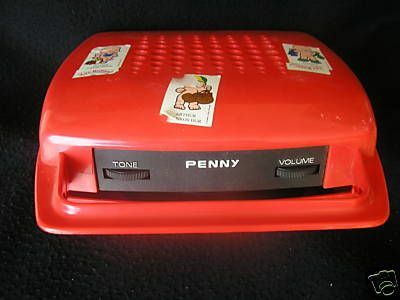 When I got older I couldn't wait to get a real stereo (although I miss that one like crazy now). The Zenith had one great thing about it. It had a "floating" needle which was pretty snazzy for 1966. Before that I had a little Webcor vinyl groove crusher with a 4" speaker that trashed every record I played on it without fail. The Zenith remarkably was so easy on the records that my 45's and LP's (and even 78's) played to death on that thing still sound fine. I remember around 1971 my Dad taking me to Thrifty Drug Store to buy a replacement needle for it. Cost under $2.00. If a 1966 portable player can protect the records even while playing the heck out of them so should any modern machine no matter how cheapass it is. The problem is the arm and the needle in these cheaper modern tables. THE SHAPE OF THE TIP IS CRUCIAL TO RECORD PROTECTION. My first non-Zenith stereo was one I got at Gemco. It was a CONCORD! Remember that brand? It had a receiver and on top of it was a Garrard record player. Just hook up $100.00 white box Gemco speakers and bingo, loud music. It sounded pretty good but the cheap diamond needle just mistracked on everything and my records suffered because of it. Inner groove distortion (something I had not experienced with my trusty Zenith) became a head-scratching issue. I soon realized that mistracking (that shreading sound on one or more channels especially near the end of a side on loud peaks) was ruining my life. It didn't just sound bad but it destroyed the record groove, never to be repaired. The cart in there was a Shure M44-E. (The problem was the E part). Should have used a conical or spherical tip... That's another story (and another Audiophile argument). After about six months I couldn't stand it (never got a Garrard anything ever again) and I asked a friend who worked at University Stereo (remember them?) what to do. He told me to get a receiver (Sony, Pioneer, etc.) and a separate turntable. He told me the turntable really wasn't that important it was the cartridge and stylus that mattered. He said if I wanted to play my records without mistracking I needed a "high trackability" needle and than meant Shure but at a higher quality level. "Noooo!" I said. "Yesssss", he said. So, after painting my parents house, I took the money and "upgraded". I bought a totally marked down new 100 watt Pioneer 1010 receiver for under 500 bucks, some JBL 100 speakers (traded them in after a week, they gave me a headache) and a turntable, the total bottom of the line Pioneer manual belt-drive PL12D. The tonearm floated free of any inner device to return the arm to the rest. I figured this was the best kind of arm to have in a cheapo table. When I upgraded the speakers to AR3a's I could clearly hear everything "uncolored" as they used to say. I started with the "hot" cheap cart at the time, a Shure M95ED. I put it on my PL12D and it worked OK but I could still hear mistracking. I saved for a month or so (bought no records at all or anything else) and upgraded to the Shure V15 Type II Improved. All of a sudden I could play the last song on any album with almost no mistracking. My output went down but I just turned the volume up. So I spent $98.00 on the new Pioneer PL12D turntable. I spent $75 bucks or so on the Shure V15 Type II cart (a fortune to me in those days). The Pioneer 1010 receiver (a great buy at under 500 bucks) and the AR3as put me in the red for a year. This system lasted me through school, college, radio jobs, music jobs all the way through DCC when I gave the system to Marcia McGovern at DCC to use. It's still going great, ORIGINAL CART!!! My point is, I solved the mistracking problem back in 1975. It is the most important thing to PROTECT YOUR RECORDS. .
YOU MUST DO THE SAME. Find something that doesn't mistrack, if your cheap MM or MC carts are mistracking, find a way to fix it, fast. I had the answers way back in 1975. I can't imagine that things have not improved since then. I can't direct you to what is safe now but I'm sure some people here can. Remember, this is for VINYL NEWBIES. Don't tell me about $1,500.00 turntables and $500.00 carts. If you want to dabble and not spend much, there has to be a safe cart you can play with for not much $$. The Shure V15 is out of print, I'm sorry to say but is there something on that level that is not much money? Sorry for the ramble, not much sleep..
BTW, my vintage Thorens 124 has a Shure M44-G cart that I paid $25.00 for and it doesn't mistrack ANYTHING either. My Webcor Groove Crusher (upper right in Blue Chip Stamp catalog) and the old 1966 Zenith fold out stereo that saved my records from ruin..
eternalise, CDFanatic, Dynamic Ranger and 58 others like this. I'm using the McIntosh MT10 turntable right now and I am very happy with it. No mistracking even on some of the "torture test" records I've cut. Of course it's like 10 grand or something.. Nonetheless, my Thorens 124 has a Shure M44-G cart that I paid $25.00 for and it doesn't mistrack ANYTHING either. Steve, does your Shure M44-G use a vintage stylus or do you have one of the newer ones on it? SinnerSaint and Daniel Thomas like this. Boy, rereading what I wrote I can tell I'm sleep deprived, heh. Ghostworld and McLover like this. Thanks for the information Steve. I will never get bored learning about audio. Very fine post, well explained. Mistracking is to be avoided at any costs. The Zenith with the Micro-Touch 2G cartridge system was very gentle on records and tracked well by any standard. My grandmother's old Philco console had a similar VM made turntable and similar cartridge system. It treated my collection very well and those records survived well. So this $350.00 cart will work in a cheapass turntable (one that costs less than the cart?) Has anyone tried that? It's crucial to know. What isn't mentioned here that is critical is cartridge setup and alignment. Even the best cartridge improperly setup will mistrack. There are a number of good test records and alignment tools available for a reasonable amount of money that will help you setup your turntable (regardless of cost) to the best of its capability. starfieldroad, SinnerSaint, Leonthepro and 1 other person like this. Okay, thanks. I had been wondering if the newer ones were just as good as the older. So is the M44-G a better tracker than the M44-7 that you also like? The 7 is a heavier tracking I think, up to 3g. The G is .75 to 1.5g. That was a good read. Here's a dumb question, as I still consider myself very much a vinyl newbie: if cheap diamond elliptical needles are to be avoided, what is another type of stylus material/design? I was under the impression that most stylus were constructed like this. Yes, I used it in my cheap, bottom-of-the-line, direct-drive Sanyo from the mid-80s. Of course, I set it up with a protractor, tracking force gauge, and a couple of test records. OK, so I am using a grado cartridge (presumably a "CHEAP DIAMOND ELLIPTICAL NEEDLE") with a p-mount. If I understand correctly, I should upgrade. Advice, please...! I have some pretty valuable records, so don't want to kill 'em. Thanks! Well, you don't want to use anything other than diamond. But a cheap, inferior elliptical stylus can easily do more damage than a decent conical. Ah, conical. That's the other type I was thinking of. BDC, Shak Cohen, sortvinyl and 2 others like this. Very good info, thanks OcdMan and dmckean. I've been into vinyl since I was 10 (so it's been 8 years now)....so I'm not a newbie. But I do have a question. My upstairs turntable sometimes only let's one channel of sound come through, and on the other channel there is usually no sound or distortion. So, would this be considered "mistracking"?? It is failing to track one channel of sound. Or is this something completely different all together? Especially for the time, amazingly well. VeeFan64 - Check your connections. Try switching cords from left to right to determine if it is the cord, the cartridge, or the amplifier. Are "MicroLine" and "Micro-Ridge" more extreme versions of "line contact"? Some older AT carts were branded as "Linear Contact". Shibata was probably the first line contact type. Conical/spherical styluses track better than an elliptical of the equivalent price. While they track at higher tracking force, they ride shallower in the grooves where they don't do as much damage. Are you sure about this? That they track better? My understanding has always been that the smaller front to back profile of elliptical (and line contact) styli was better able to trace high frequencies, especially in the inner grooves. 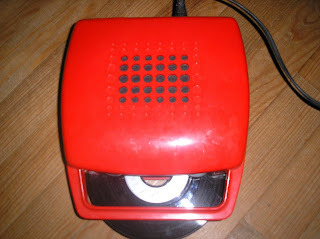 My first record player, age 5 or something. Mine was actually purple, exact same model though. At the time I wondered why my 45s were all trashed after a few spins. wwright and cracklehead like this. It is not the cords or the amp. I'm almost 100 percent certain that it is either the cartridge or something wrong with the turntable itself. Should I try a new cartridge and see if that works? Just wanted to throw my two cents in here. I've never managed to get my hands on any of the Shure V-15 series cartridges though I have gone through a lot of other cartridges by Shure. Right now I'm using a SME III arm—someone correct me if I'm wrong, but wasn't it designed to work ideally with the V-15 series of cartridges? In any case I'm using a Shure 97 cartridge with that arm right now and the synergy between that arm and that cartridge is notable, particularly with the built-in stabilizer in play. It will sail through all sorts of old LPs without a trace of distortion, like the early mono copy of "Ella in Berlin" I found in a thrift store just a few weeks ago. While I'm aware from other threads at this forum that it's not everyone's cup of tea—it's a bit rolled off on top—I just want folks to know that set-up properly it's an excellent tracker with lots of midrange detail and a well defined bottom. Two points in particular. First, it is sensitive to set-up, overhang in particular. Second, at a street [really more like internet] price hovering around $60 it's one of the best bargains for phono cartridges right now. If you're experiencing mistracking [bad news, as our host pointed out in the OP] and you're strapped for cash, this could be your solution.